Where do we check in for our stay? Flying Arrow Resort & Wallowa Lake Resort are now ran out of the same office located at 84681 Ponderosa Ln Joseph, OR 97846. About 300 yards before Flying Arrow Resort. This location is where you will pick up the keys to the cabin and pay the remaining balance. Where is Flying Arrow Resort located? We are located at 59782 Wallowa Lake Hwy Joseph, OR 97846. What are the office hours? The office is open from 9am to 11am and 3:30pm to 5pm. During the winter, the hours can change, but the phone is always answered. What do we do if we arrive after 5pm? Come to our main office where we will have an envelope with your last name on it taped to the front door of our office with a key and a map to the cabin inside. 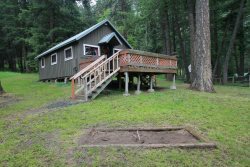 How do I pick the best Wallowa Lake Cabin Rental for our trip? There are many options to pick from. Once you know your dates and how many people will be in the group, you can pick from the options on our web page or give us a call at 541-432-2951 and we would be more than happy to advise you to the best cabin for your needs. What is supplied in the cabin? The cabins come supplied with all bedding, towels, toilet paper, shampoo, bar soap, garbage bags, dish soap, pots, pans, and all basic plates, glasses, and silverware. You want to bring your own( lake towels, briquettes for the BBQ, paper towels, napkins, and wood if your cabin has a wood burning fireplace). When is our remaining balance due? The remaining balance is due upon arrival. How much is the motel tax? Oregon charges 1.80% and Wallowa county Charges 5% for a total of 6.8% could change as laws change.. I am ready to make a reservation what do I do now? You can book on our secure web page: www.wallowalakecabinrentals.com , call us at 541-432-2951, or email us at [email protected] and give us your information. How much of a deposit do I need to make a reservation? You only need to put down one nights stay for that cabins deposit. How do I get my confirmation? It will be emailed to you and if you don't have an email it will be mailed to your address. When do I pay the balance of our reservation? You pay your balance when you check in to your cabin at the office. Can we make payments before our stay? Absolutely, just give us a call and let us know how much you want to have paid. When do we need to check out of our cabin? Check out is 11 am. Is there WIFI? Several of the cabins do have WIFI and are provided as a courtesy and is not guaranteed. If they do have WIFI, it is listed on the cabin description page. If your cabin does not, it is available around the office area and at several restaurants in Joseph. Where can we buy groceries? Walmart in LaGrand. Can we have outdoor fires? Sorry we are in a heavily wooded regulated area and are not allowed to have outdoor fires. Is there a hospital in the area? Yes, in Enterprise. Is there cell phone coverage at the lake? Most Verizon and US Cellular phones now work. Hopefully AT&T will down the road. Where is the best place to buy auto fuel ? It is best to fill up in LaGrand on your way in and out of the county, fuel is usually 30 cents a gallon cheaper.